Pesto has become my new favorite go to replacement when I’m just not feeling traditional red pasta sauce. 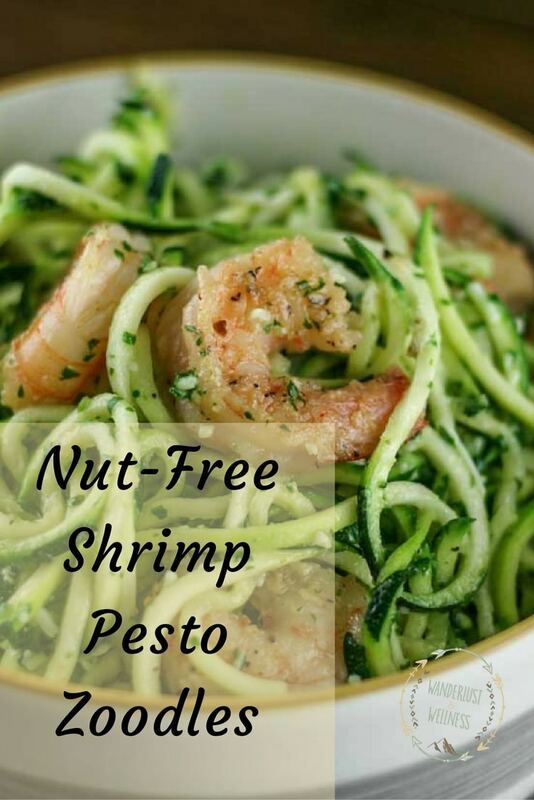 The challenge is finding a pesto that is nut-free, because most standard pestos contain pine nuts. I introduced this nut-free pesto a few weeks ago when I posted the Gluten-free Caprese BLT sandwich recipe. 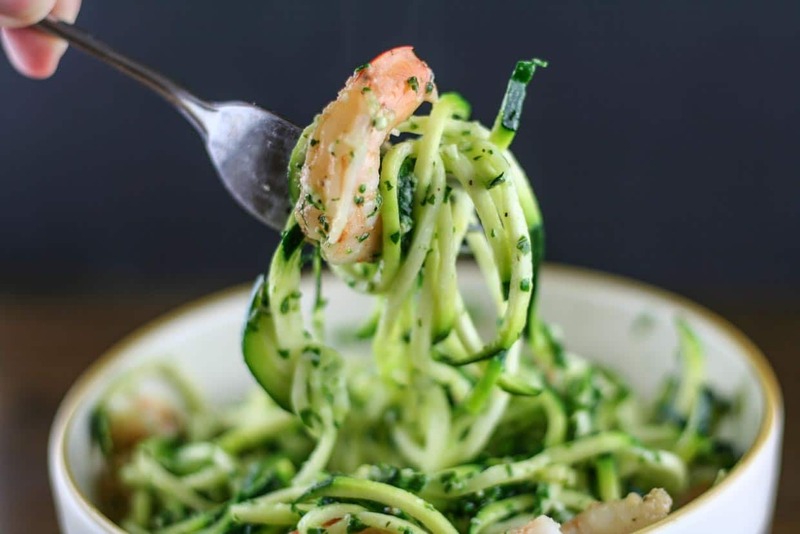 This shrimp zoodle pesto dish uses the same pesto recipe. The shrimp + pesto + zoodle combination here make this a light dinner option to add to your recipe collection. Zoodles are super simple to make, too. Pick up a spiralizer, you can find them easily on Amazon, and you’re ready to go to town. This dinner took me under 15 minutes to put together! You can also switch out the pesto for traditional red pasta sauce, if you prefer. Pick up some fresh, wild-caught shrimp, sauté with lemon-pepper seasoning and you’ve got yourself a quick and easy dinner. Make the pesto ahead of time by adding all pesto ingredients into a food processor and blend until well combined and you have a nice paste. Set aside. In a medium skillet, melt ghee and add shrimp. Sprinkle on lemon-pepper seasoning to taste and sauce for about 10 minutes, turning occasionally. In a separate skillet, add olive oil and spiralized zucchini. Sauté for 3-5 minutes, just enough to loosen them up a bit. 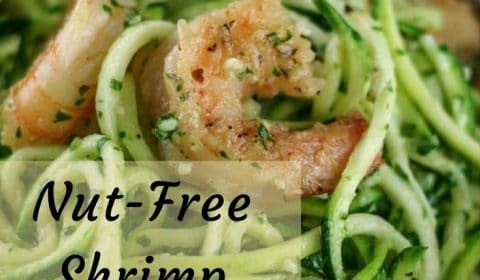 Combine the zoodles, pesto, and shrimp and serve.